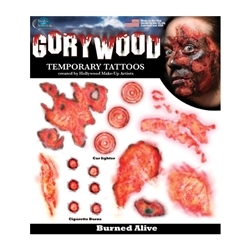 The Burned Alive Tattoo is a sheet of temporary tattoos. Our temporary tattoos are safe and non-toxic. Temporary Tattoos make for a great finishing touch to many Halloween costumes, or you can prank your friends and family on a whim!